The first recorded mention of a Christian place of worship on the site of St Mary’s is in the fourteenth century when it was established that Henry de Tyes held the Manor of Alverton plus a chapel where services were held, sited just over 2 miles from the Madron Parish Church. This was the Chapel of Our Lady which was on the site of the present church. Henry de Tyes also endowed a chantry in the chapel. However, it is likely that the Normans founded a much earlier chapel on the headland hence the name Pensans – meaning holy headland. A church was licensed by the Bishop of Exeter in 1379 but under the spiritual leadership and control of the Vicars of Madron. In fact, this arrangement did not change until 1871 when Penzance became a separate parish. At the time of the Reformation chantry chapels were closed and in 1547 the Church Commissioners reported that the population of Penzance was growing and the town was within the Parish of Madron. The people of Penzance were instructed that they should go to Madron for worship as the town was in danger from raids by the French and Spanish. This was proved to be true by the 1595 raid by the Spanish on Mousehole and the burning of Paul Church. In 1662 the church was re-built and there are various pictures of this building with its distinctive spire. However, before the Bishop of Exeter consecrated the church a number of conditions were imposed including the fact that all fees and dues were to be paid to the Vicar of Madron and that the people of Penzance should go to Madron for the four great Festivals of the Church and take their Easter Communion at Madron. 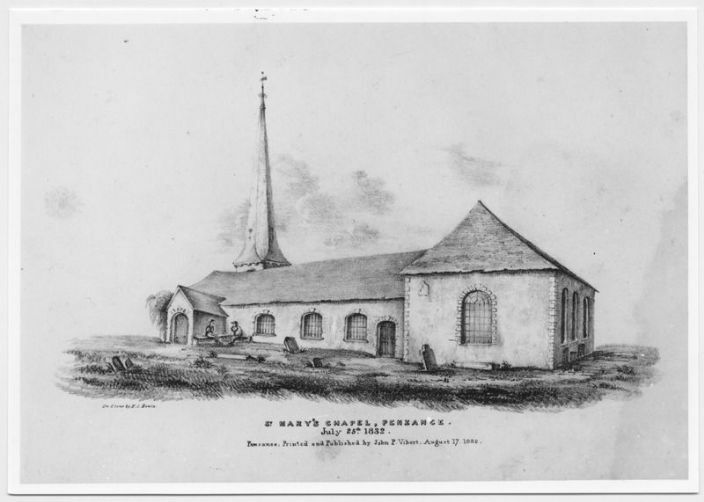 By the early 19th century there was pressure for a new church and on Wednesday 23rd April 1828 a public meeting was held in the church to discuss the matter. 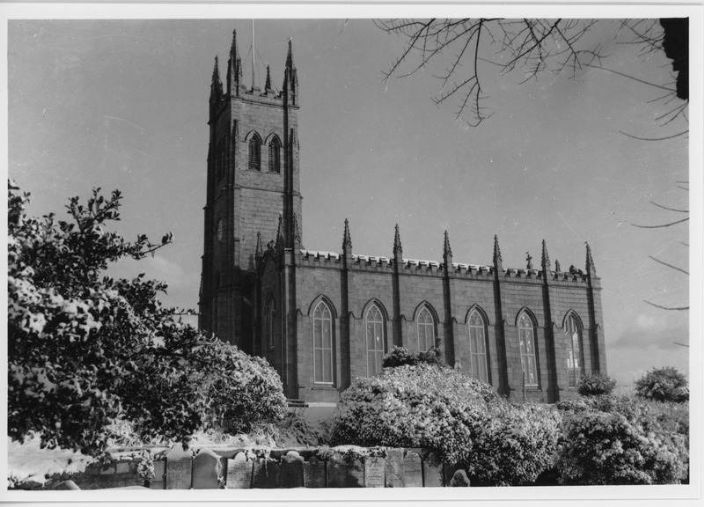 A Committee was appointed, subscriptions from families for pew-sittings were organised (rents for pews was abolished in 1895) and estimates for the building were obtained. Mr Charles Hutchens of St Buryan was appointed as the architect. The foundation stone was laid on 17th August 1832 by the Mayor of Penzance. A bottle was buried under foundation stone containing a parchment roll with the names of the Mayor, the architect, the Curate and the Chapel Warden. Mr Hutchens' design of a finely cut granite in Commissioner’s Gothic style church with its imposing tower dominates the Penzance skyline. Inside it is light and spacious with a gallery on three sides.